Dog Halloween costumes are a great way to celebrate the season with man's best friend! If you are looking for a few cute dog Halloween costumes, then you have certainly come to the right place. Even better is the fact that there are literally thousands of great ideas to choose from! One of our favorite Halloween traditions is to dress our puppies in cute dog Halloween costumes. 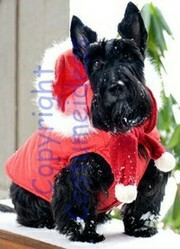 This is our adorable Scottish Terrier. Each year, when the weather turns cool, we love to dress her up in cute costumes. One year, we dressed her as a dragon. In this picture, she was Santa's little helper. Don't laugh, there are hundreds of thousands of dog owners all across the world that do the same thing. She is, after all, part of the family. Why exclude her from all the fun! I do not know about you, but these dog Halloween costumes are so darn cute! This dinosaur raptor dog costume is ridiculously adorable. Small dogs are notorious for their incredibly snippy temperaments. How much fun would it be to dress these little pups as a big mean dinosaur? Buy a Cute Dog Halloween Costume Here! The headpiece cracks me up as my other dog, a Silky Terrier, is always flashing his teeth at just about anything that moves. The yellow eyes and matching full length bodysuit really helps create this overall look. Your puppy will certainly scare away those big, mean cats while dressed in this outfit! One thing I am sure many people will appreciate is that the costume actually connect around your dog's belly; making it more difficult for them to get out of it on their own! Your dog already thinks he is Superman, why not let him dress this part this Halloween? This officially licensed Superman costume is sure to get a lot of smiles this year. Super cute and adorable, he will be able to leap tall bushes in a single bound! Superman's classic 'S' is predominately displayed for all the evil-doers to see (mainly cats that is). My Silky thinks he is a Jedi Master. Sometimes I believe he may be right. He has a unique way of moving me off the sofa any time he wants to go for a walk. It has to be some kind of Jedi mind trick. This officially licensed Star Wars costume is sure to be a crowd pleaser this year. Just don't let him tempt you to join the dark side! Check Out the Rest of the Available Halloween Costumes for Dogs! Want to really embarrass your dog this Halloween? Dress him in one of these butterfly dog costumes and his pals will have the time of their doggie lives. I imagine this would be such a fun costume; especially for big, burly dog such as a Boxer or a Bull Dog. The contrast between their normal tough exterior and this costume is just plain funny. No doubt about it! This costume has been officially licensed by Animal Planet and is a great way to break the ice this Halloween. Funny dog costumes don't get much better than this! Dressing you canine friend in cute costumes can be a lot of fun. One thing you need to remember is that their safety should always be your main concern. Do not leave your dog in any outfit while they are not being directly supervised. Additionally, if it is hot, please do not force them to wear a costume all night. They will hate it and will be miserable. Halloween provides pet owners the perfect excuse to dress their puppies in adorable dog halloween costumes! Oh my god, these costumes are so cute! The Yoga Dog costume is just amazing.